It doesn't happen very often, but here's an album that I instantly fell in love with ... Unfortunately there's little or nothing to be found about The Sapphire Thinkers in either hardcopy or on-line reference works. So here's what little speculative material I can add to their slim biography. Given their album was mastered at Pasadena's Artisan Sound Recorders and released by the Hobbit label which was a subsidiary of the L.A. based GRT Records, they were probably from California. Judging by the back cover photo and performances credits they were a five piece, with a lineup consisting of bassist Tim Lee, singer/multi-instrumentalist Bill Richmond, vocalist Peggy Richmond, drummer Stephen Richmond and lead guitarist Chuck Spehek. Produced by Richard Kaye, their album was engineered by former Merry Prankster sound man Sandy Lehman-Haupt. Curiously, at least one well known reference work compares the mysterious Sapphire Thinkers to Grace Slick and The Jefferson Airplane. While there's nothing wrong with being compared to such a stellar outfit, it doesn't really do this outfit a favor since it's not a particularly accurate comparison. 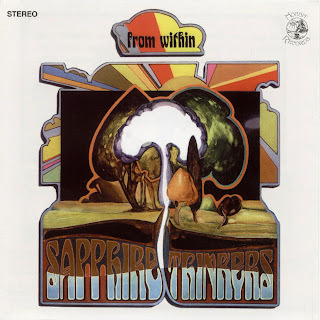 With Bill Richardson credited with penning eleven of the twelve songs, 1969's "Sapphire Thinkers" reminds me of a heavily drugged out version of The Mamas and the Papas, Spanky and Our Gang, or perhaps a less eccentric, but heavily dosed version of The Free Design. Like those groups, these folks had a penchant and talent for crafting gorgeous, highly commercial sunshine pop - though their version was assisted by the consumption of various illicit substances (yes, I do believe those were mushrooms on the Kevin Leveque cover art). Complete with mesmerizing melodies and hypnotizing harmony vocals (both Bill and Peggy Richardson had great voices), songs such as 'Get Along Boy', 'Let Her Come In' and 'Please Understand' would have sounded great on top-40 radio. Even better was 'There's a Woman'. You just had to scratch your head and wonder how radio missed the song. All songs by Bill Richmond except where noted. 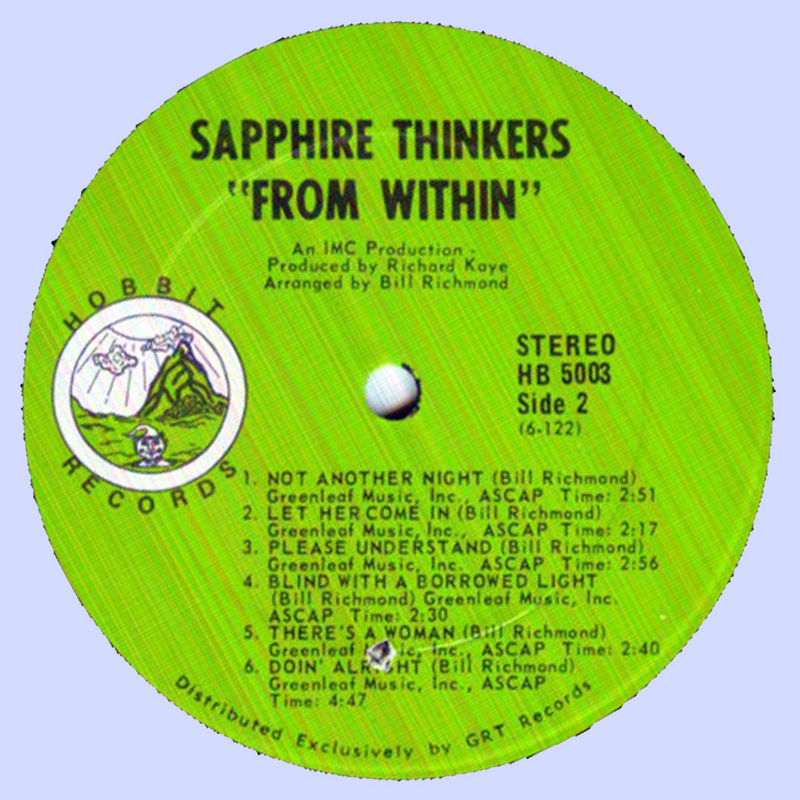 The Sapphire Thinkers was an American Psychedelic band who he recorded only one album,"From Within", (Hobbit Records 503) in 1968. The band's founder, Bill Richmond, currently lives in Los Angeles' San Fernando Valley and continues to write and produce original music. 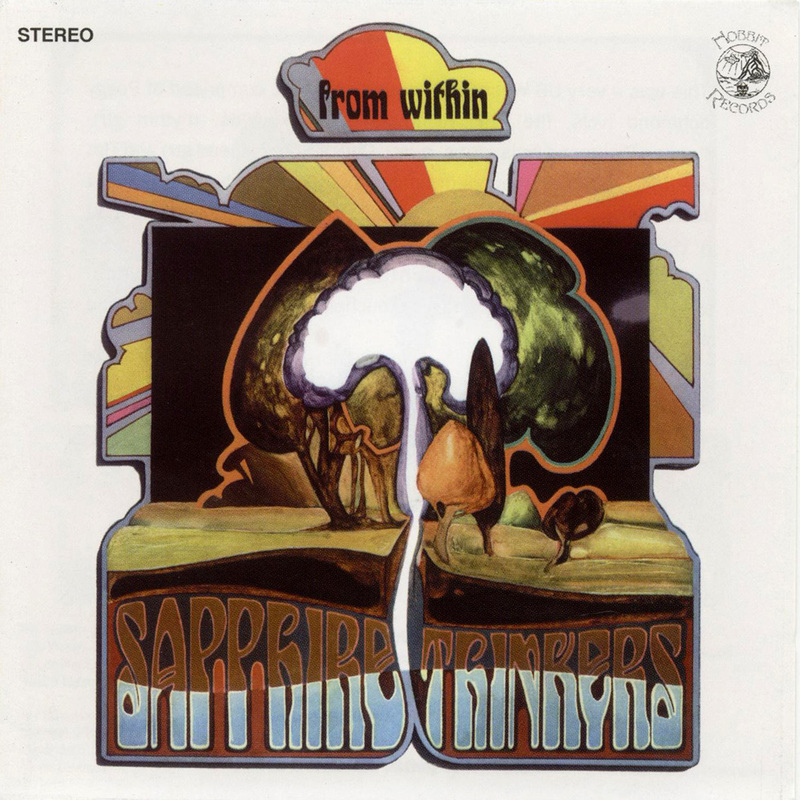 of the tracks, and the sprinkling of flute over the album,the title track "From Within" and the amazing "I Got To You" which is contains the best harmony work on the album and some beautifully introspective guitar pieces. This is another talented band that did not get due recognition which certainly deserves. Such a fine album. Thank you for the upgraded post! This is very interesting that I came across this band on the internet yesterday afternoon while searching for some family history. I in fact have an uncle Charles Spehek, the brother of my father Albert Spehek. I will do some asking around and maybe supply some details if I find any. Is this the same Bill Richmond of Billy and the Kid who recorded a single for Decca ("Shut Down Again" b/w "Troubles of My Own") in '66?